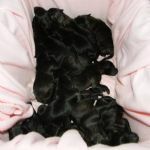 On 19th January 2009 Faith (Anduril Greyfriars Faith) safely delivered a litter of 13 puppies sired by Jeremy (Mapleridge Jeremy) This litter are placed in homes all over Australia. All of our puppies leave with full vaccinations, health checks and are microchipped for safety. 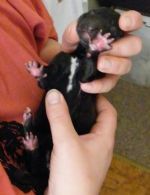 Faith was able to naturally deliver her puppies and managed to feed them all - quite an achievement given there are 13 of them! 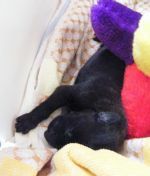 Below are a few early photos of the litter of 8 boys and 5 girls. 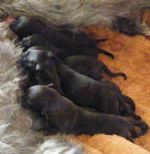 If you are interested in owning a Scottish Deerhound puppy please contact us and we'll be happy to explain what we expect of our prospective owners and our conditions of sale. A couple of dogs from this litter stayed with us here at Anduril and have their own profiles listed. If you are interested in seeing them you can view their profiles from our web pages listed at The Anduril Boys and The Anduril Girls. We are very pleased with the way this litter developed producing Australian Champions Robbie and Meg, who have won significant awards in show. Robbie has gone on to be a Best in Show winner at Adelaide Royal Show 2013 from an entry of 2619 dogs under Swedish judge Mr Kenneth Edh. 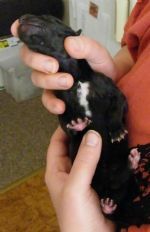 The pedigree names for this litter are themed around Robert Burns, Scottish national poet. 2009 is the 250th anniversary of his birth on 25th January 1759 in a cottage in Alloway, Ayrshire. A number of celebrations were held throughout the year in Scotland. 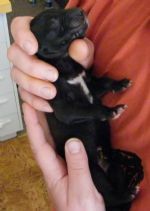 This litter was born right on their due date of 19th January 2009. Some of Burns most well known works include Auld Lang Syne, Tam O'Shanter, A Red, Red Rose, The Young Highland Rover, John Barleycorn, The Twa Dogs, The Lass O'Ballochmyle, Selkirk Grace, Brig O'Doon and the Address to a Haggis. Click on each individual photo to view a larger version. This function also gives you the ability to scroll through the photos in larger size. Seven weeks and full of mischief!